Definition at line 28 of file CQModelValue.h. Definition at line 32 of file CQModelValue.cpp. Definition at line 44 of file CQModelValue.cpp. 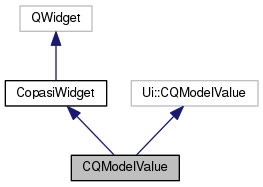 Definition at line 201 of file CQModelValue.cpp. Definition at line 267 of file CQModelValue.cpp. References CKeyFactory::get(), CCopasiRootContainer::getKeyFactory(), load(), mKeyToCopy, CopasiWidget::mpListView, mpModelValue, CopasiWidget::mpObject, and ListViews::switchToOtherWidget(). Definition at line 184 of file CQModelValue.cpp. Definition at line 248 of file CQModelValue.cpp. Definition at line 297 of file CQModelValue.cpp. References CModelEntity::ASSIGNMENT, FROM_UTF8, CModelEntity::getExpression(), CModelEntity::getInitialExpression(), CModelEntity::getInitialValue(), CModelEntity::getRate(), CModelEntity::getStatus(), CModelEntity::getValue(), mChanged, mpModelValue, slotTypeChanged(), and CModelEntity::StatusName. Definition at line 347 of file CQModelValue.cpp. References CModelEntity::ASSIGNMENT, ListViews::CHANGE, CCopasiRootContainer::getDatamodelList(), CModelEntity::getExpression(), CModelEntity::getInitialExpression(), CModelEntity::getInitialValue(), CModelEntity::getStatus(), mChanged, mItemToType, CopasiWidget::mKey, ListViews::MODELVALUE, mpModelValue, CopasiWidget::protectedNotify(), CModelEntity::setExpression(), CModelEntity::setInitialExpression(), CModelEntity::setInitialValue(), and CModelEntity::setStatus(). Definition at line 76 of file CQModelValue.cpp. Definition at line 81 of file CQModelValue.cpp. References CQMessageBox::confirmDelete(), ListViews::DELETE, FROM_UTF8, CCopasiRootContainer::getDatamodelList(), CModelEntity::getDeletedObjects(), CCopasiDataModel::getModel(), CCopasiObject::getObjectName(), CopasiWidget::mKey, ListViews::MODELVALUE, mpModelValue, CopasiWidget::protectedNotify(), and CModel::removeModelValue(). 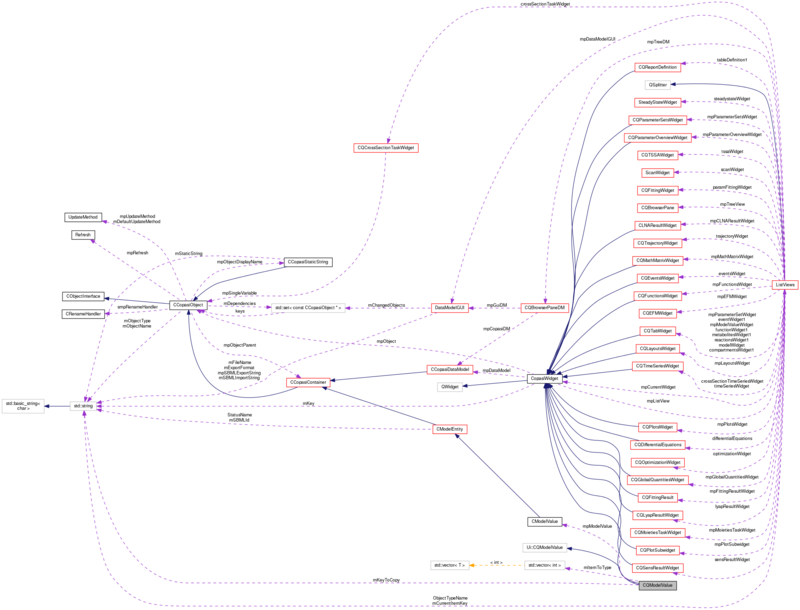 108 protectedNotify(ListViews::MODELVALUE, ListViews::DELETE, "");//Refresh all as there may be dependencies. Slot to create a new quantity; activated whenever the New button is clicked. Definition at line 51 of file CQModelValue.cpp. References ListViews::ADD, C_INVALID_INDEX, CCopasiRootContainer::getDatamodelList(), CModelEntity::getKey(), leave(), ListViews::MODELVALUE, CopasiWidget::mpListView, mpModelValue, CopasiWidget::protectedNotify(), ListViews::switchToOtherWidget(), and TO_UTF8. Definition at line 174 of file CQModelValue.cpp. Definition at line 179 of file CQModelValue.cpp. If the initial expression is chosen to be used by checking the mpBoxUseInitialExpression check box being represented by the boolean parameter useInitialAssignment (true if checked; false otherwise), COPASI will show the Initial Expression Widget with its correct push buttons. Otherwise, the widget and its buttons will be hidden. Definition at line 406 of file CQModelValue.cpp. Definition at line 121 of file CQModelValue.cpp. References CModelEntity::ASSIGNMENT, CModelEntity::FIXED, mItemToType, CModelEntity::ODE, and slotInitialTypeChanged(). Definition at line 204 of file CQModelValue.cpp. References ListViews::ADD, ListViews::DELETE, load(), CopasiWidget::mIgnoreUpdates, CopasiWidget::mKey, ListViews::MODEL, ListViews::MODELVALUE, mpModelValue, CopasiWidget::mpObject, and ListViews::STATE. 224 // If the currently displayed metabolite is deleted we need to remove its references. Definition at line 47 of file CQModelValue.h. Definition at line 48 of file CQModelValue.h. Referenced by init(), and slotExpressionValid(). Definition at line 49 of file CQModelValue.h. Referenced by init(), and slotInitialExpressionValid(). Definition at line 45 of file CQModelValue.h. Referenced by init(), leave(), save(), slotInitialTypeChanged(), and slotTypeChanged(). Definition at line 55 of file CQModelValue.h. Definition at line 46 of file CQModelValue.h. Referenced by enterProtected(), load(), save(), slotBtnDelete(), slotBtnNew(), and update().